The most annoying enemies in the game, these won't stop spawning until you leave the area. One hit from the sword, bow or boomerang will kill them, though. The next step up from Miniblins. Take them on one at a time- four hits from your sword will destroy them. Try not to get caught in a large group. They're also the first enemies you encounter. They come in three varieties: the normal blue Bokoblins, which attack with their claws, swords or Boko Sticks, the green ones, which are tougher, wielding a sword and shield, and the red ones that can be found on rafts in the Great Sea, scouting with telescopes. If a Bokoblin has no weapon, it will try hand-to-hand combat, or pick up another enemy's weapon, and even wield a Darknut's sword. If you use your Grappling Hook on them, you receive a Joy Pendant. The final stage of 'blins. Slash them until it looks like they're retaliating, then use a parry attack or block their blow with your shield. About 6(?) hits will take care of them. Be careful of their surprise jabs or huge spear swipes. They can also be frozen (making them useless) if the skull necklace they are wearing is grappled off. Brown Moblins carry torches, and will use them as a defense. Annoying flying enemies. The easiest way to take them down is to L-Target and use the boomerang. They also appear as 'Fire Keese', which will set you on fire if you are struck by them. The next step up of flying enemies, but they still go down with two hits from the boomerang or sword. Red ChuChus just try to jump at you. Avoid their jumps and hit them with your sword. Green ChuChus can shrink into the ground, making it hard for you to slash them. Either wait for them to pop up, or stun them with the Boomerang before attacking them. Yellow ChuChus conduct electricity, and shock you on contact. Stun them to stop their electric current before attacking. They don't stay electrified at all times, making it their weakness. Usually, they're found in ancient buildings. Blue ChuChus are very rare, but behave in the same way as Yellow ChuChus, except they're always charged. Purple ChuChus, also known as Dark Chuchus, are found in dark places like the Earth Temple. They can't be hurt physically, but are vulnerable to light. Reflect light at them from your Mirror Shield to turn them into stone, and then throw them or use the Skull Hammer to smash them. The Blue ChuChus drop Blue Chu Jelly, which makes a Blue Potion at 15 jellies (Life & Magic), but only once. 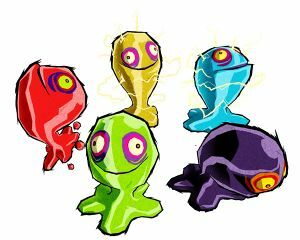 Yellow ChuChus do not drop Chu Jelly of their own kind, but green or red sometimes comes out. Purple ChuChus also don't have a specific jelly they drop. These giant plants will swallow you if you get too close, but a hit from the boomerang or Skull Hammer is enough to take them down. But if you have neither, jump attack then slash for a fast kill. 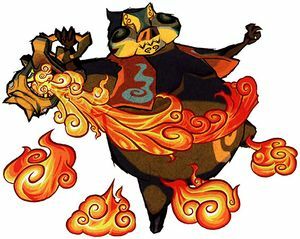 Wizzrobes have the power to summon other enemies such as ChuChus, Keese, Bokoblins, and Peahats to name a few, and all the while teleporting around the room, shooting fireballs at Link. Either shoot them with arrows or hit them with the boomerang to stun them, then slash them with your sword. There is a particularly skilled one of them, the Red Wizzrobe, found deep within Wind Temple that has the power to summon other and some even stronger enemies such as Darknuts, Moblins, Fire Keese, Red Bubbles, and other Wizzrobes. Undoubtably the toughest regular enemies, they have impressive sword and martial art skills, and can counter the Spin Attack and even imitate the Hurricane Spin. These knights cannot be harmed while they have their armor. Use a Parry Attack to the head to destroy their helmets or cut the seam in their armor's behind to knock the armor off them, then attack normally. Without their armor, they will charge at Link, so dodge this with a sidestep. Darknuts come in five colors: gray, silver, gold, black, and red, gray being the weakest and red the strongest. 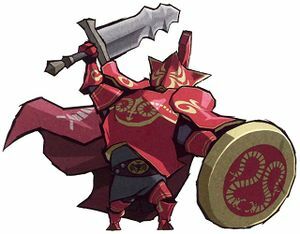 Tougher Darknuts also exist, such as the Shielded Darknut, which has a shield, and the Mighty Darknut, which has a cape. Mighty Darknuts will need at least three parries: one to sever its cape, one to smash its helmet, and one to slash its armor off. A large butterfly/moth that shoots spiky burrs called Morths at you, weighing you down. They come in winged and non-winged varieties. Winged Mothula are slightly more aggressive and tougher. 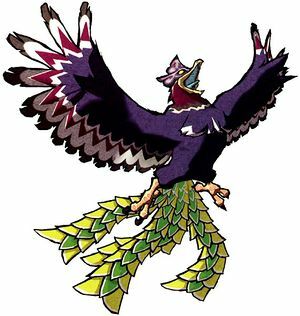 They can be stripped of their wings with the Deku leaf, Boomerang, or Fire Arrow, among others, but these enemies, like many others, are the most vulnerable to one hit by a Light Arrow. 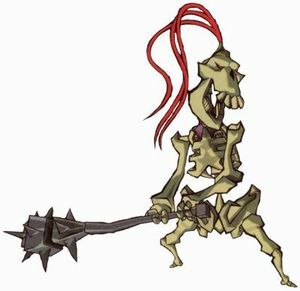 Stalfos are living skeletons that lug spiked clubs with them, and move very slowly because of the club's weight. They come out of coffins and the ground, and can be defeated with a combination of bombs, the boomerang, and your sword. After enough damage is done, or by using bombs, the Stalfos' body will shatter into pieces and its head will bounce away from you (like an injured Bubble). It can reassemble itself if it is given enough time to recover. Using the Skull Hammer on its skull after breaking it apart will kill it in one hit, but it is easier to do this after hitting the head enough times for it to stop bouncing. They can also be cut in half, in which case the torso and legs will separate and walk around. A set of dismembered legs will aim kicks at you, while the torso, on the other hand, is helpless and will try to avoid you. 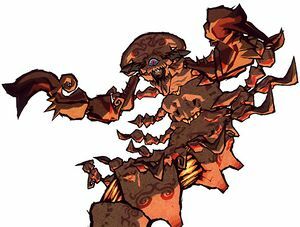 Picking up a Stalfos' club while it is shattered and waiting until it reassembles will cause the Stalfos to pull off its own arm and use it as a weapon. 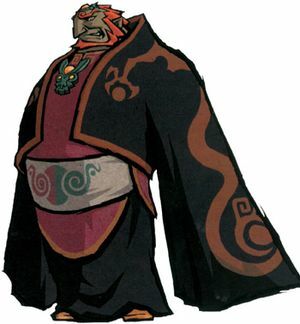 Phantom Ganon, Ganondorf's feared shadow. Ganondorf's powerful and mysterious minion, Phantom Ganon is a dangerous enemy that appears once in the Forsaken Fortress and returns to fight constantly in the maze of Ganon's Castle. He has four attacks. His first and most common attack is to create a blue ball of energy, which he fires at you, and you have to volley it back with your sword (or empty bottle) until either you or he is hit. 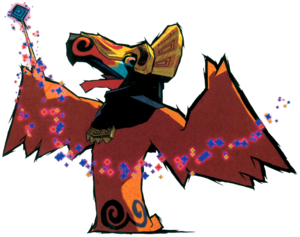 His second attack is to create a large dark red energy ball, which splits into a group of small red balls of energy flying towards you, and you must counter them with a Spin Attack or Hurricane Spin. His third attack is to appear on the ground and swing his sword at you. It can be countered if you're quick on the draw. 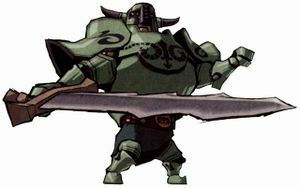 When he returns, he will use his fourth attack, swinging his sword at you like before, but with three illusions of himself. It is harder to counter, but still possible. The first time you face him, he will take several hits before vanishing. After beating him, you get the Skull Hammer. When he returns in the maze, he will vanish after just one hit, and the handle of his sword will point at the door you must take to advance. At the end of the maze, he will put up more resistance, and take several hits before he vanishes. After beating him there, you get the Light Arrows. In the final battle between him afterwards, a Light Arrow is the only thing that will put an end to Phantom Ganon once and for all. Sentinel enemies that create a floating eye and shoot a beam at you. Blue Beamos can only shoot in a straight line, enabling you to smash its eye with an arrow. Red ones can follow you 360 degrees, and so are harder to hit, but they can be destroyed. Sentinel enemies that can move. They all have one eye and a gem on their back. Slash at the gem to kill them. Armos Knights are far larger and can only be killed by throwing a bomb in their mouths. Dragon Roost Cavern: Gohma may look intimidating, but he's really quite easy to beat. Wait until it tries to attack and gets its claws stuck in the ground, then quickly Grappling Hook Valoo's Tail. After you let go, the rock will land on Gohma and crack its shell. After this has happened three times, Gohma will be vulnerable. Grappling Hook its eye then slash it with your sword, and it will be gone in no time. Forbidden Woods: The first thing you should do is start running in a circle around the boss. Wait until it has finished trying to attack you with it's tentacles, then cut down the supporting vines with the Boomerang- this will make the body split open. 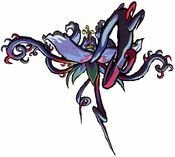 Get as many attacks onto the central flower as you can before the boss swallows you and spits you out again, then repeat the process until it dies. Tower of the Gods: Gohdan has several attacks- mast of them done by the hands, which will try to swat you into the electricity off the side of the stage. If you do find yourself there, get out FAST, or it will kill you. Using the bow, L-Target the hands to deactivate them, then go for the eyes on the main body. As soon as the hands are out, and occasionally before, the head will unleash a barrage of energy blasts at you. Just keep running to avoid them, because they can kill you very quickly. Once the head is deactivated, throw a bomb into Gohdans mouth. Once you've done this three or four times, Gohdan will surrender and you will have won the battle. Forsaken Fortress: The first part of the battle is quite easy: just run up the spiral without stopping. The King will try to smash the floor from under you, but if you just keep running, Link will automatically jump and grab onto the next section. Once you are near the top, smash the King's head with the Skull Hammer, and the second phase of the battle will begin. All you have to do is wait until the King tries to peck you, then sidestep- his beak will get stuck in the floor, so then Skull Hammer his mask. After this has been done once, the King will fly and try to claw you or blow you into the spikes, but just wait for him to land again so that you can hurt him, in the same way as before. After three attacks, the King's mask will fall off, so you can hurt him with the sword, boomerang, or bow until he dies. Earth Temple: Jalhalla only has three attacks- he will try to scorch you with his lantern, blow you away, or possess you. While possessed, your controls will be reversed, so if Jalhalla turns blue, try to dodge his attack. To defeat him, shine light onto him like a regular Poe, then lift him and throw him onto one of the spiked pillars to split him into about 15 regular Poes. Use regular or Hurricane attacks to defeat as many Poes as possible before he re-forms. Once all the Poes are dead, you have won the battle. Ganon's Tower: Puppet Ganon has three stages: humanoid, spider, and snake. To beat the humanoid Puppet Ganon, use the boomerang to sever all of his blue strings (the red center one cannot be severed). The strings will take multiple hits before they fall. While Puppet Ganon is vulnerable in this position, shoot the glowing blue crystal on its tail with a light arrow. Shoot the tail with three light arrows to go to the next stage. 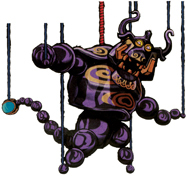 In the spider stage, Puppet Ganon retracts into the ceiling and spins around. Use his reflection in the pool on the floor to see where he and his blue crystal will land. Position yourself so you can shoot the crystal with a light arrow when he comes down. Three light arrows will put an end to the spider. Finally, in the snake stage you must avoid Puppet Ganon as he rampages rapidly around the room. It's best to find a way to get up on the wood areas high above the ground. (You may have to move a bit while targeting, because the monster hits the walls)You must shoot the blue crystal three times to rid yourself of Puppet Ganon forever. Shooting the snake's head will stun him, but only briefly. Ganon's Tower: In Ganondorf's first stage, you cannot hit him normally. You must wait for him to attack you and then parry his attack to stun him. Once he is stunned, you can hit him from behind with the Master Sword. Meanwhile, Zelda runs around the room shooting Ganondorf with light arrows. When the second light arrow hits, the second stage of the battle will begin with a cut scene of Ganondorf knocking Zelda over. The second stage is fought exactly like the first stage, except Ganondorf's attacks are more vicious. After a few hits, Zelda will wake up and tell you to distract Ganondorf. This is the beginning of the third and final stage. Zelda will shoot at your mirror shield with a light arrow and you must reflect that arrow back at Ganon. When that attack connects, Ganondorf will be stunned. To unleash the final blow, run up to him and press A. This page was last edited on 11 November 2015, at 01:20.